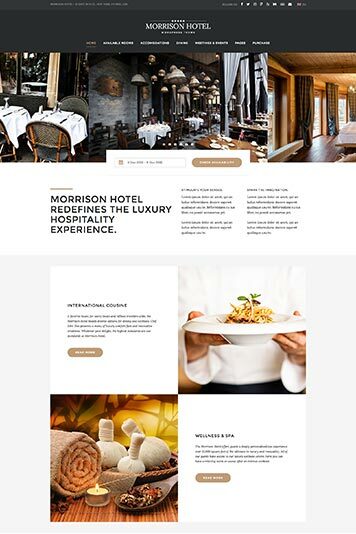 Morrison Hotel uses Easy WP Hotelier, a powerful WordPress plugin that allows you to manage your hotel, hostel, bed and breakfast reservations with ease. Accept multiple rooms in a single reservation. Manage the price of your rooms, create a variable room with rates, set the stock, require a percentage deposit and more. 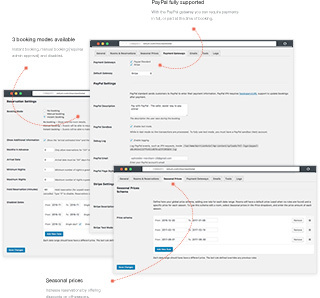 A big collection of cool features that can help you to build a stunning website with ease. Enjoy your creativity! 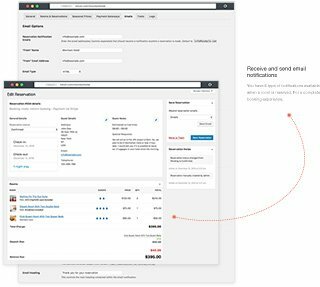 With the PayPal gateway you can require payments in full, or part at the time of booking. Instant booking, manual booking (requires admin approval) and disabled (show only the room details). Increase reservations by offering discounts on off-seasons. Maximize your revenues during the slow period. You have 6 type of notifications available when a room is reserved. For a complete booking experience. In a variable room with rates each variation may have a different price, required deposit or conditions. 3 different pricing options available: global price, different price for each day of the week or seasonal prices. 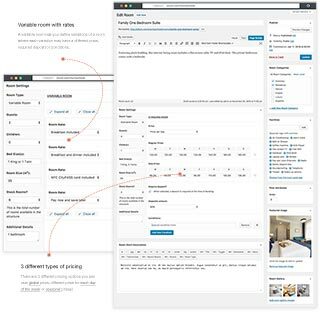 With this drag-and-drop feature you can structure the content of your pages visually and with ease. Morrison Hotel provides an optional top bar and 3 different header styles (left, right and center aligned). Morrison Hotel is built and maintained by the Easy WP Hotelier core developer. No conflicts and full support. Choose between boxed and wide layout. A boxed layout allows you to set a fancy background to your website. Morrison Hotel fully supports WPML (not included). With WPML you can display your content in multiple languages. Morrison Hotel lets you choose the appropriate plugins for your needs. This ensures security and direct support from the plugin’s author. Use a left, right or no sidebar on any page, room or post you desire. And drag your preferred widgets to them. 3 fine tuned color schemes ready to use. The default dark skin, an elegant blue skin and a fancy purple skin. The theme strictly follows the WordPress review guidelines and security. Clean coded and easy to understand. You can use the Customizer to preview and modify many of your site's appearance settings. Morrison Hotel is fully responsive and looks beautiful on any device, from mobile to desktop. A child theme is the safest way to modify an existing theme. A ready to use child theme is already included in Morrison Hotel. With progressive enhancement in mind, Morrison hotel was tested to make sure it looks great with all modern browsers. Like WordPress, the philosophy behind Morrison Hotel is to encourage simplicity. Simple but powerful. Elite author support, regular updates, flexible color options, Google web fonts and SEO friendly. All the demos can be freely combined and imported in a few clicks. 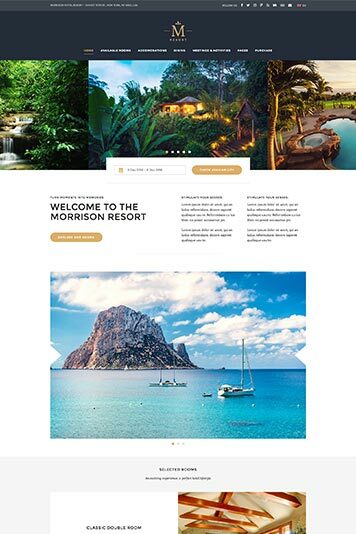 Or you can create your own unique hotel website through the theme’s powerful options. The default demo with a dark skin. Perfect for hotels. Tropical resort version with an elegant blue skin. 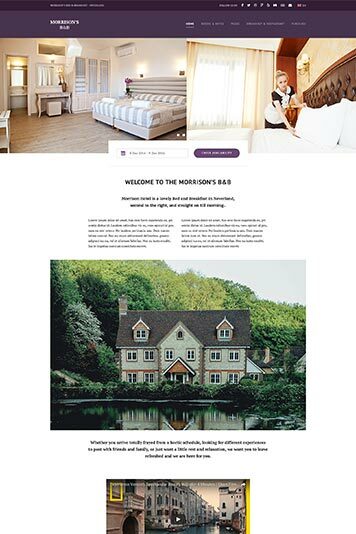 A purple skin and a boxed layout for this B&B. 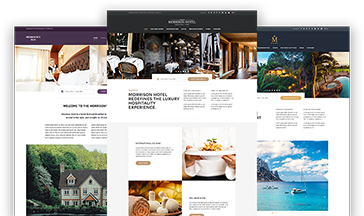 Are you looking for other hotel WordPress themes?